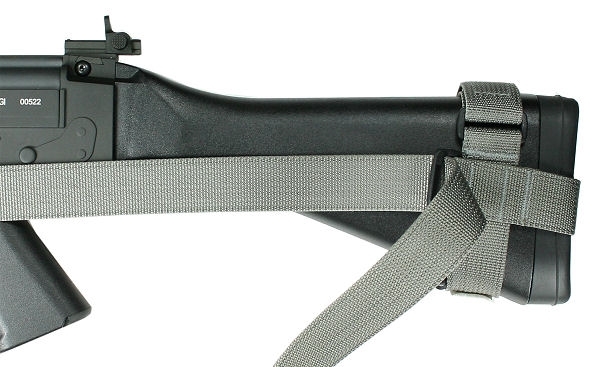 This sling is designed to fit fixed stock FN FAL variants with side mounted front sling swivels. NOTE: If you have a "Para" version with a side folding stock and a receiver mounted rear side sling swivel, the Universal CST Sling is the correct application for your weapon. Combining the best features of the CQB and SOP Sling designs, the CST Sling is a truly unique and versatile 3 point tactical sling design. The CST Sling features the same 1.25" wide webbing and adapter layout of the CQB Sling combined with the Transition Release Buckle (TRB) feature that has proven to be so popular on the SOP Sling. The TRB allows the sling to be quickly and efficiently extended to instantly create slack that allows for easy left/right shoulder transitions. This feature addresses a common complaint associated with conventional 3 point tactical sling designs. With those types of slings it's very difficult, if not impossible in some cases, to execute a cross shoulder transition. This creates a serious problem in an urban environment. With the TRB feature the sling can be used exactly like a conventional 3 point design, allowing all of the same carry options. However, when the need to cross shoulder transition is anticipated, simply flip the TRB release with the non firing hand thumb and the 3rd point of the sling is released to slide freely along the sling allowing you to extend and mount on the opposite shoulder. The sling, however, is still attached and still functional allowing you to "let it hang" should a secondary weapon transition be called for. When the time comes to re-lock the TRB, it can done so quickly, silently, and with just one hand needed, allowing the shooter to maintain a constant firing grip on the weapon. The TRB can also be locked in wherever the shooter finds it comfortable. This feature allows for convenient expansion and contraction of the sling's body loop as the operator's mission profile changes and more, or less, load bearing equipment is worn. Should you require the ability to completely release the sling from your body, the Emergency Release Buckle (ERB) feature is available on this sling as an optional feature. We've deliberately designed the sling to use two completely different buckle designs for the TRB and ERB features to avoid any confusion between the two features. Unless otherwise specified (Such as with the Universal Fit version), the CST Sling you order will come equipped with appropriate mounting adapters or hardware to attach the sling to your weapon. You will not need to purchase any separate mounting hardware. As with our other slings, our CST Slings use the highest quality materials and are stitched on heavy duty industrial machines using mil-spec #69 nylon thread. Realizing the needs of our end users we ensure strict quality control standards and have over engineered these slings to deliver long term performance under harsh conditions. Our CST Slings are fully modular and fully ambidextrous and can be easily set up for left or right hand applications. Additionally, our CST Slings can also be completely disassembled should you change your weapon configuration or wish to add features to your sling.